Goa is one place where fame is not an impossible dream, as long as you possess the talent. Age does not seem to be a determining factor either as proven by the late thirties and forty something rockers of a music group called Bad Blood. Consisting of a crew of musicians from diverse backgrounds, Bad Blood is making Goa proud with their first single, Tomorrow’s Yesterday, which has aired on VH1, MTV Indies, R-Vision and 9XO. Nixon Soares was a college going teenager who wanted to make a bit of pocket money and indulge his passion for rock music at the same time. This was the beginning of Bad Blood. Only Nixon remains of the original line up that came together nearly twenty years ago. Today Bad Blood is made up of Blasio Pinto, Aurvile Rodrigues, Anthony Fernandes and Frazer Andrew Pacheco. Blasio Pinto, a pharmacist, lends his powerful tenor voice to the vocals of the band. For the most part, he performs with his band, Skye High, along with Aurvile Rodrigues. Aurvile is a sound engineer and the band’s percussionist, while Anthony Fernandes, one of Goa’s best bass guitarists, juggles with accounts with equal finesse. Frazer is keyboard player and music producer for the group and plays for the band, Lynx with Anthony. Bad Blood has come together to play rock shows at the Arlem Festival, the Seafood Festival, the Kingfisher Festival, the Battle of the Bands and many others. They also host Rock in Goa and Guitar Gods, shows designed to present performers of rock music and keep the rock scene alive and kicking in Goa. The shows are organised by the band’s event company, Rock Bugs Goa. Last year, the band played for the first time in the UK at the Goan Festival. They had about 18,000 Goans grooving to their Goan music and had successful performances in various English pubs too. This year they will be releasing their second video for Why Should I?, on 28th March at the latest Rock in Goa concert. The concert is to be held at Quinta de Valadares and as usual will draw an audience of bikers with their Harleys, Easy Riders and Enfields. 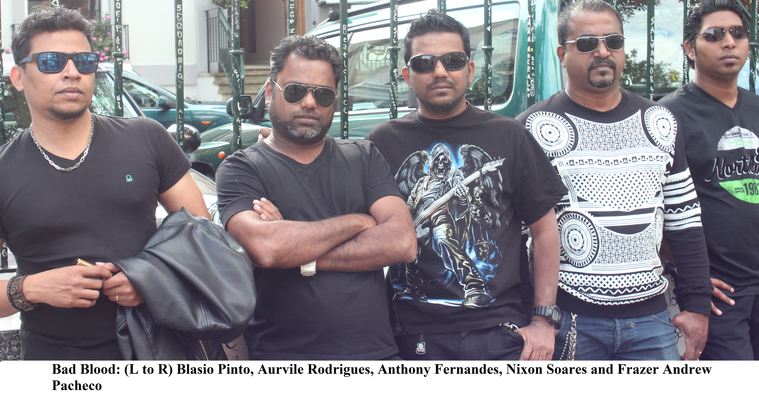 Nixon, who also has a degree in automobile engineering, says, ‘Rock in Goa has always been associated with bikers. We always host another rock artist at the show. This year we will have Baiju Dharmajan who plays for Syndicate and used to be a member of the Indian rock band Motherjane. He is renowned as a guitarist for his Carnatic rock music.’ This ‘God of small strings’, as Baiju Dharmajan has been dubbed by his fans, has also strummed his melodies for Ashiqui 2. August, moreover, is the month for another fantastic display of rock music with the Guitar Gods of Goa. Raising Steam is another Bad Blood project which centres on experimental music. Influenced by a myriad of rock and metal bands such as Sting, Van Halen, Dream Theater, Rush and Alter Bridge. Nixon says, ‘We were basically a classic rock band but we have fused heavy metal too, being inspired by Metallica, Judas Priest, Iron Maiden and others.’ The band engages their fans with country rock, progressive and funk besides the normal fare of classic rock and performs unplugged at resorts, restaurants and clubs such as Baywatch and Fiplees. Nixon’s major complaint about the present music scene is –‘There should be more rock shows in Goa. There few live shows happening due to the timing. More organisers and the government should take the initiative.’ He believes certain well publicised shows are too commercialised and apt to sway youngsters from good live music. After so many years of rocking entertainment, the five have taken the time out to compose an album. ‘Most of us were busy in our own bands and lives. Finally we decided to buckle down and bring out an album,’ says Nixon. Blasio and Nixon have contributed to the lyric writing and the rest of the band members are more involved with the music composition. Bad Blood has plans for a South East Asian tour. Nixon tells us, ‘Before you go on a tour you need to have the backing of an album behind you. We already have six songs ready to be recorded in the studio.’ He assures us the album will be ready for release in August.